Wee Companions Small Animal Adoption, Inc. - Gone Camping! During the earlier years of Wee Companions, before we had a more solid “team” to care for our sick animals, my home was ICU central and I was the full time staff. It was likely a control issue in the early days, but age and wisdom have thankfully helped me share the responsibilities, now. Regardless of rising at ungodly dark hours to hand feed sick animals before work (I do not classify myself as a naturally happy early morning person), fighting sleep to give the last evening feeding, plus the odd night shift, care of the wee ones took priority, and this was the accepted norm, rescuers accept such things as a matter of course. To say the least, juggling a work schedule with sleep deprivation was challenging, and telling colleagues I was up at night, “feeding the kids” never caused much of a reaction; after all, I had human kids at home and most parents accept exhaustion as the normal price to pay for having kids. Animals were nursed back to health with extra care and often went on to be adopted or brought to a point that they could live out their days in relative health. Some were nurtured to a peaceful passing. Thankfully, we now have foster homes that can offer that more intensive kind of care 24/7. We also have designated Hospice Foster homes! Rescue is more than a happy adoption photo, it’s being responsible for all those in your care, whatever life stage they are in. Previously, if an animal was sick and needed care throughout the day, well, they just had to have it! If I was scheduled to go away, well…they just came, too! Camping trips, that were a part of my family’s life for many years, were rarely unaccompanied by some rodent. The usual greeting from fellow campers was...”What did you bring us this time?” Small portable cages and bags of mystery green sludge, for those that were not eating, were packed up along with the tents and sleeping bags and off we went! Many a Wee Companions piggy got to enjoy the delights of campfire evenings, wrapped up and toasty warm, with the fire’s reflection in their eyes. Often, the center of attention for the children in the group, they got to enjoy the extra loving. Further, being away from the everyday rescue work offered me the chance to enjoy just being with the animals on these trips, and I usually formed a strong bond with them and their recovery. Camping in Borrego Desert, on a horse trip, was particularly memorable one year, with three guinea pigs in tow, all in need of regular hand feeding. Can you picture me balancing lanterns, hand feeding formulas, and spirited guineas? This juggling act usually meant I slept in green-stained pjs with the stars of the Milky Way the only witnesses! Sleeping in the back of my Surburban, I was often lulled to sleep by the gentle rattling of water bottles and soft contented coos; I would then wake up eye to eye with a piggy wheeking for his breakfast! It seemed very cozy to sleep so close to the animals and quite natural. I found a cool spot for them during the day time in a large cool horse trailer and they too got to enjoy the outdoor life for a few days! Not many piggies have the chance to say they have gone camping! Taking needy animals where they are not “technically” permitted needs extra planning! The largest undercover operation I’ve achieved was hand feeding a wild baby rat that had been brought to us that could not have survived the 9 hours I was away from the house at work. Packed in a small plastic carrier that fit neatly into a shopping bag, along with heated medical warming plate, and formula, we set off for work, daily, where she sat under my desk until lunch time. After clocking out for lunch, I took my shopping bag into the public restroom and sat for 20 minutes in a stall, carefully feeding this precious package her formula from a cotton ball. Despite the odds against her, she survived and lived as my special girl for 4 years! 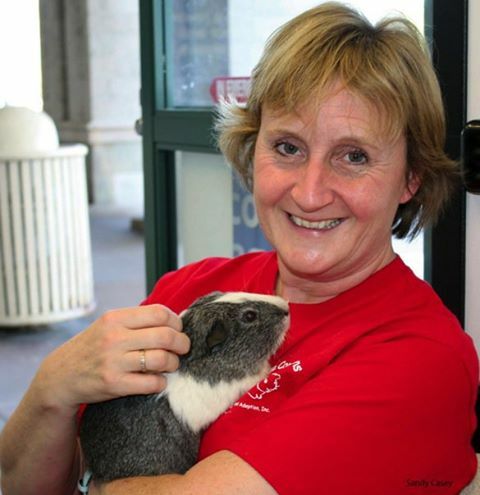 Living our lives alongside our animals is something that comes naturally for rescuers. We can’t imagine a home without pets and we choose to give up many luxuries (sleep for one) because there are animals in need. Nowadays, I have volunteers who can provide the ICU care when I go away. However going away without an animal to care for just seems…well...empty.